If you have an enquiry or would like to purchase an item please send me a message and I'll get back to you as soon as I can. 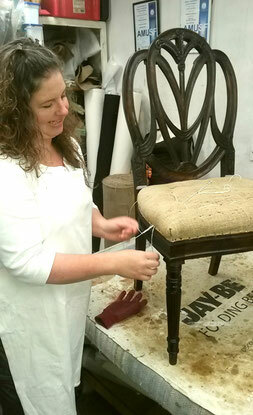 A desire for more creativity in my life led to retraining as an upholsterer. I was smitten with this all-consuming, traditional craft from the get-go. I started my own upholstery business after gaining advanced craft skill qualifications with the AMUSF (Association of Master Upholsterers & Soft Furnishers) in 2014 and in February 2017 I became a Full Member. I'm rather good at shopping if I do say so myself! If you see a piece of furniture you like on this site or have something particular or special in mind for your home but don't know where to start looking or just haven't got the time to search yourself I'd be happy to help. I've built up a range of contacts and uncovered numerous sources in my continuing quest for furniture projects (not just chairs) over the years. I may even have that 'must have' item in my current 'to do' collection. Please contact me to discuss your shopping list!